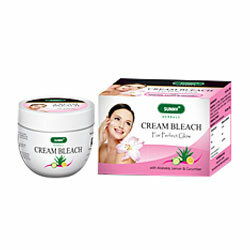 Bakson's Sunny Herbals Cream Bleach Whitens & Brightens Skin Unleashing A Radiant & Glowing Complexion. Whitens & brightens skin, radiant & glowing complexion. Provides gentle and nourishing care to all skin types. An unmatched formulation with goodness of Aloevera, Lemon & Cucumber, naturally crafted with toning and hydrating wonders, it whitens and brightens skin unleashing a radiant & glowing complexion. It provides gentle and nourishing care to all skin types & also eliminates sun tan. Wash face & pat dry. Mix Activator with the cream in the ratio of 1:4 with spatula, for 2 minutes. Using the spatula apply the mixture on the face & neck, avoiding the area near the eyes & eyebrows. After 15 minutes wash the face.